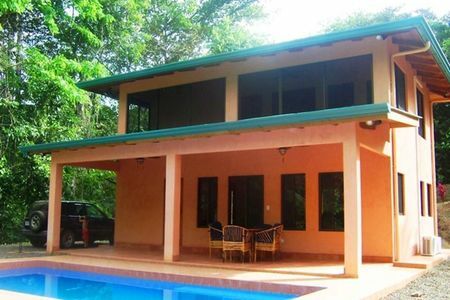 This 10-acre property is located within a gated community with wonderfully well-maintained roads, 15 minutes from the highway. 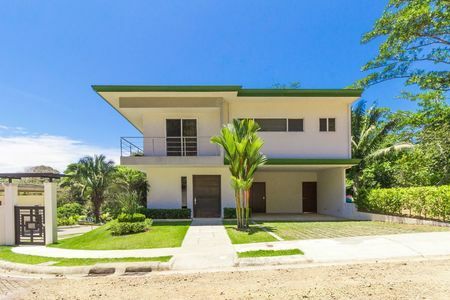 The property is a premium location with a unique vantage point which makes it possible to enjoy year-round sunsets, and offers wide valley, ocean, mountain and jungle views. 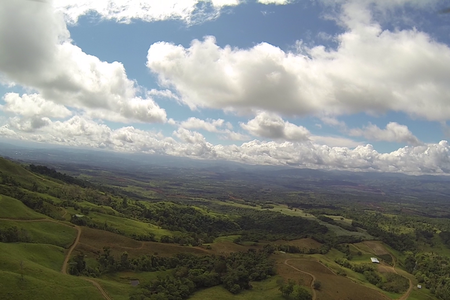 From the mountains, the green valley meets the Terraba river and Garza Island, the Pacific Ocean and the view includes Las Tres Hermanas rocks in Marino Ballena National Park and to the south Cano Island is visible. Pass through the electric gate and first you reach the primary residence of the property. 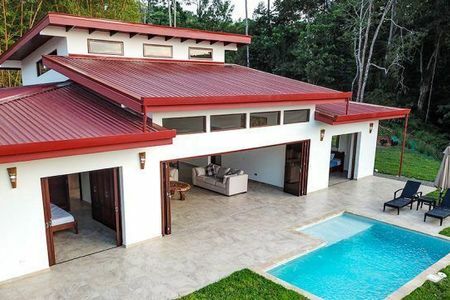 The main house is wonderfully designed with vaulted ceilings, living room, kitchen, 2 bedrooms, 2 bathrooms and a spacious outdoor covered terrace including entertaining and dining areas, and plenty of space for relaxing in the shade. The beautiful tiled infinity edge swimming pool is yet another amazing vantage point from which to enjoy incredible views. A walkway from the terrace leads to a rancho with Palmex thatched roof, comfortably outfitted with lounging chairs and a hammock. A patio located behind the house is a great place to escape the midday sun, relax with a glass of wine and enjoy the lovely garden views, before returning to the front of the house to watch the magnificent sunset. Indoors, the kitchen features granite counters, an island including 2-seat breakfast bar, stainless steel appliances and leads to the large covered outdoor dining area with Cristobal wood custom dining table which seats 8. The master bedroom is quite large, including a desk area and an ensuite bathroom. Each of the two bedrooms have custom wardrobes, and patio doors provide access to the outdoor covered terrace. With beautiful attention to detail, the wood doors are carved and glass shower doors etched featuring orchids. The laundry is equipped with matching front-load washer and dryer. To reach the secondary residence, the guesthouse, take a short walk behind the main house or continue up the driveway. 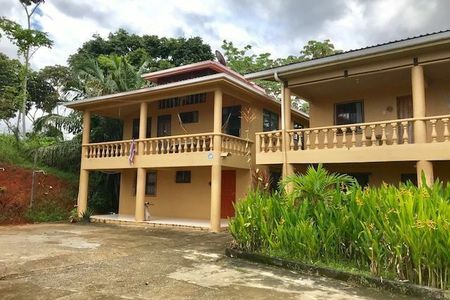 The guesthouse is located higher on the property with a view of the mountains, valley and ocean as well, but does not overlook the main house. This provides privacy for both residences. 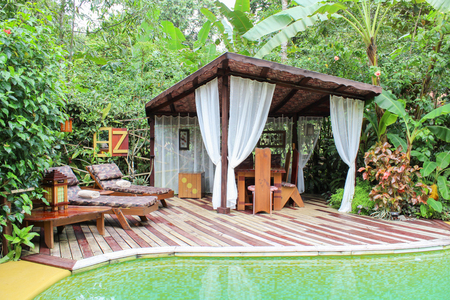 The guesthouse features 2 bedrooms, 1 bathroom with beautifully hand- carved doors featuring toucans, a well-equipped outdoor kitchen, and a 2-car garage. There is also a rustic cabina, adjacent to the guesthouse, which has 1 bedroom and a bathroom and a large covered porch. Perfect for an onsite caretaker. 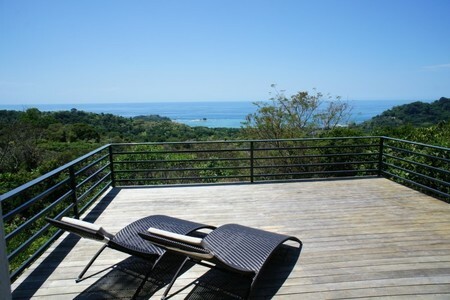 Valley and ocean views can be observed from the terrace. On one side of the property walk down 193 steps to reach the river below which borders the property, and on the other side of the property you can hear a waterfall. 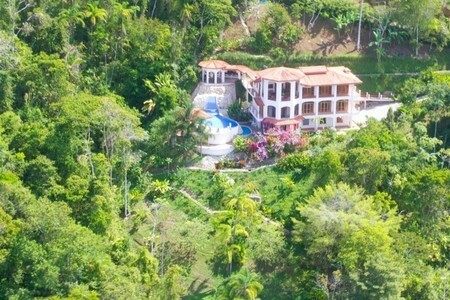 The property is lushly landscaped with a wide variety of flowering plants, numerous tropical and fruit-bearing trees. A large flat green space provides plenty of room to add a sizeable vegetable garden or expand the fruit orchard. Wildlife also abounds on this property. Through the combined efforts of the sellers and their staff, this property is in its entirety extremely well-maintained. 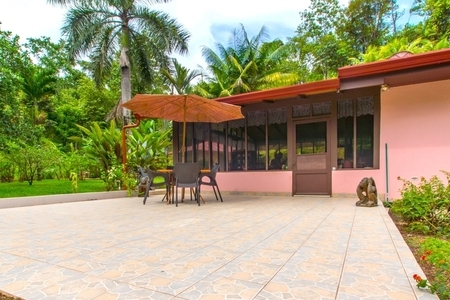 This property is already a popular vacation rental by owner website.